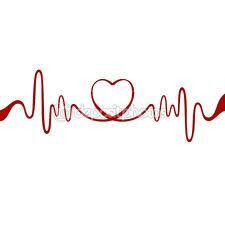 ECG is a test that measures the electrical activity of the heart. The heart is a muscular organ that beats in rhythm to pump the blood through the body . In an ECG test, the electrical impulses made while the heart is beating are recorded and usually shown on a piece of paper . This is known as an "electrocardiogram". An ECG runs at a paper speed of 25 mm/s, although faster paper speeds are occasionally used. Each small block of ECG paper is 1 mm² . At a paper speed of 25 mm/s, one small block of ECG paper translates into 0.04 s .
Graphic showing the relationship between the positive electrodes . Schematic representation of normal ECG . 1 . Heart rate : 50 to 100 beats per minute. 2 . Rhythm : consistent and even. A typical ECG tracing of a normal heartbeat (or cardiac cycle) consists of a P wave , a QRS complex and a T wave . A small U wave is normally visible in 50 to 75% of ECGs. The baseline voltage of the electrocardiogram is known as the " iso electric line ". Typically the iso electric line is measured as the portion of the tracing following the T wave and preceding the next P wave . 1 . Difficultly in breathing. 5 . When someone who feel that their own heart beat is abnormal. 1 . ECG can be used to assess if the patient has had a heart attack . 2 . ECG can be used to monitor the effect of medicines used for coronary artery disease . 3 . ECG reveals rhythm problems such as the cause of a slow or fast heart beat. 4 . To demonstrate thickening of a heart muscle (left ventricular hypertrophy) , for example due to long-standing high blood pressure . 5 . To see if there are too few minerals in the blood. Usually, an ECG is taken while the patient is resting . It may also be used to assess the success of drug treatment. ECG is done with additional tests, such as a radioisotope perfusion scan, which uses low-dosage radioactive dye to show which areas of the heart muscle receive the best and worst blood supply, or "angiography" (X-ray examination of arteries), treatment. Up to 12 self-adhesive electrodes will be attached to select locations of the skin on the arms, legs and chest. Areas such as the chest where the electrodes will be placed may need to be shaved. First, the skin is cleaned. The test is completely painless and takes less than a minute to perform once the leads are in position. After the test, the electrodes are removed . 1 . When the patient is at rest it is completely harmless . 2 . The patient may get chest pains that will resolve after the exercise is stopped . 3 . The test will be discontinued at an appropriate time such as in the case of significant chest pain . During a resting ECG, a technician will attach 10 electrodes with adhesive pads to the skin of your chest, arms and legs . Men may have chest hair shaved to allow a better connection. You will lie flat while the computer creates a picture, on graph paper, of the electrical impulses traveling through your heart. It takes about 10 minutes to attach the electrodes and complete the test, but the actual recording takes only a few seconds. 1 . Braunwald E. (Editor), Heart Disease: A Textbook of Cardiovascular Medicine, Fifth Edition, p. 108, Philadelphia, W.B. Saunders Co., 1997. 2 . American Heart Association Guidelines for Cardiopulmonary Resuscitation and Emergency Cardiovascular Care - Part 8: Stabilization of the Patient With Acute Coronary Syndromes." 3 . Braunwal E. (Editor), Heart Disease: A Textbook of Cardiovascular Medicine, Fifth Edition, p. 119-123, Philadelphia, W.B. Saunders . There are generally no risks . Because this procedure merely monitors the electrical impulses and does not emit electricity, there is no risk of shock . ECG is a test that measures the electrical activity of the heart. In an ECG test, the electrical impulses made while the heart is beating are recorded and usually shown on a piece of paper . This is known as an "electrocardiogram". ECG can be used to assess if the patient has had a heart attack . When the patient is at rest it is completely harmless .